Matty and the boys getting ready at the barber’s. Don’t you love how stress-free and simple it is for men to get ready for their wedding day? Meanwhile us girls have to be up at the crack of dawn and run around like nervous wrecks making sure everything is perfect! Ha ha. 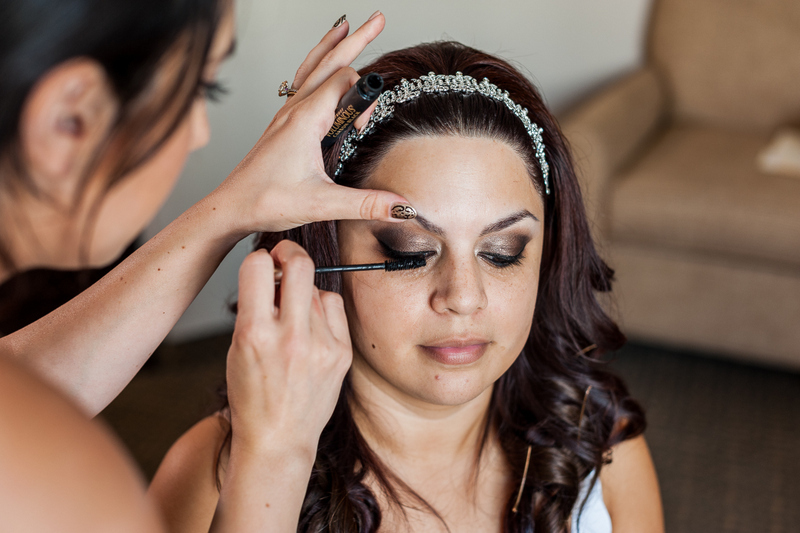 In my 13 years of doing weddings, I have come across two kinds of brides: the “Natural” bride and the “Smoky Eye” bride. Guess which one Nikki is? We went with colors from Urban Decay’s Naked 1 palette and added some Blackberry and Shadowy Lady eye shadow from MAC for a dramatic flair. She has really lush eyebrows so I added just a bit of brown eye shadow and set them in place with clear eyebrow gel. My partner Melina and I got all 10 of these beauties ready. We had so much fun getting to know these witty and chatty ladies! Nikki with her sisters. I loved the choice of going with black for the bridesmaids dresses. 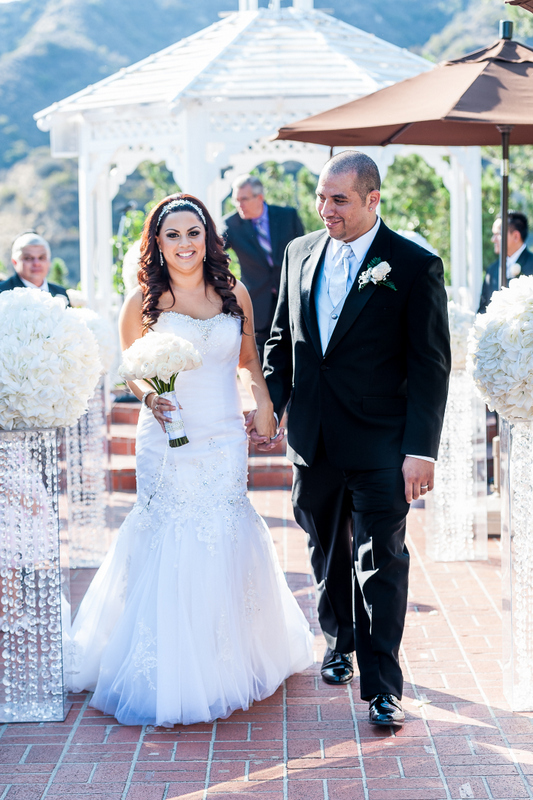 It really made this November wedding feel modern and classic at the same time. 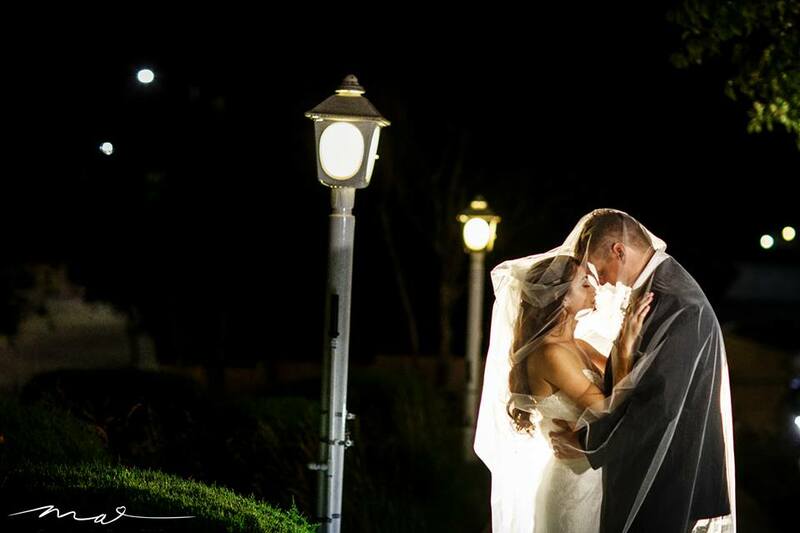 Ugh first looks always make me cry! One of my favorite wedding shots is the obligatory aerial church photo. It really shows the architecture of these beautiful, and often times historically old, buildings. 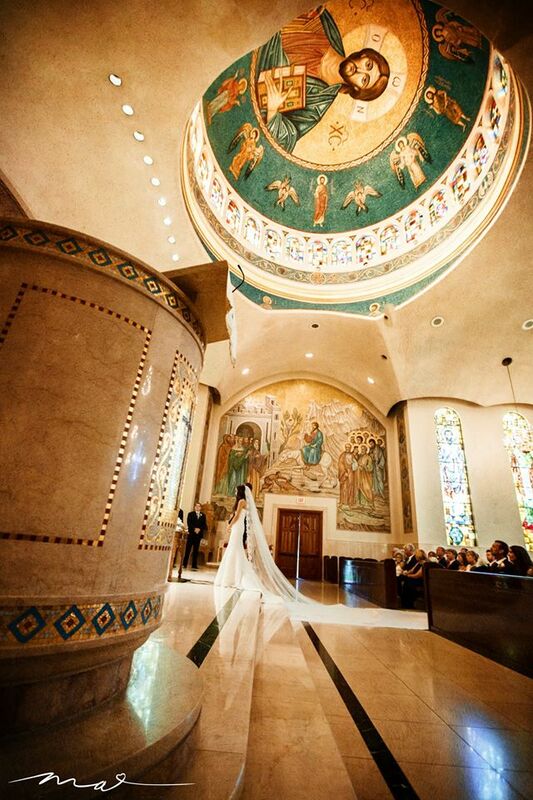 All weddings are beautiful, but there is just something about ones that take place inside a church that intensify the emotion and meaning of the day. FEELS! Take a look at this big fat, sophisticated Greek wedding party. Take in those clouds! 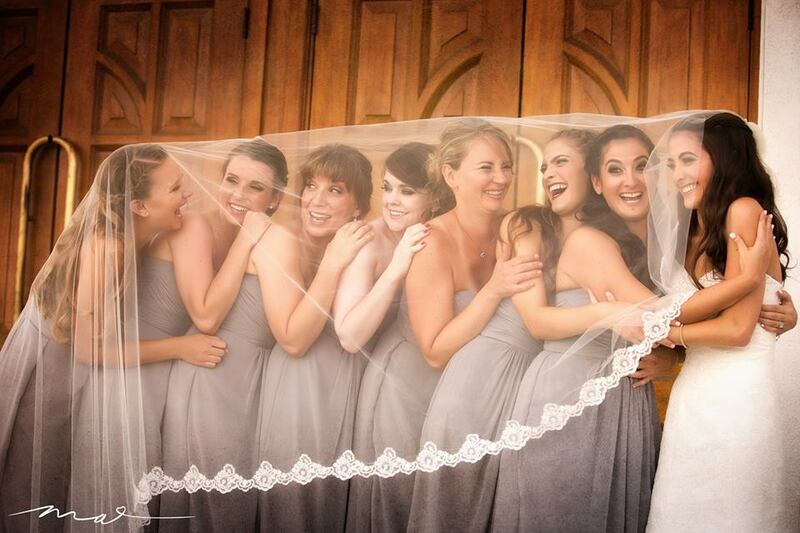 Makes you think about just how small we are in this great big world… Side note, Nikki’s veil is everything! The crowd taking part in a traditional Greek circle dance. I love it! It’s wedding-recap time! This past June, I had the opportunity to do the makeup for seven bridesmaids and the bride herself, Mrs. Melanie Butters. Because it was such a large party, I called in my most trusted makeup artist pal to help me beautify these babes, Allyson Stagg of The Las Vegas Style Sirens. 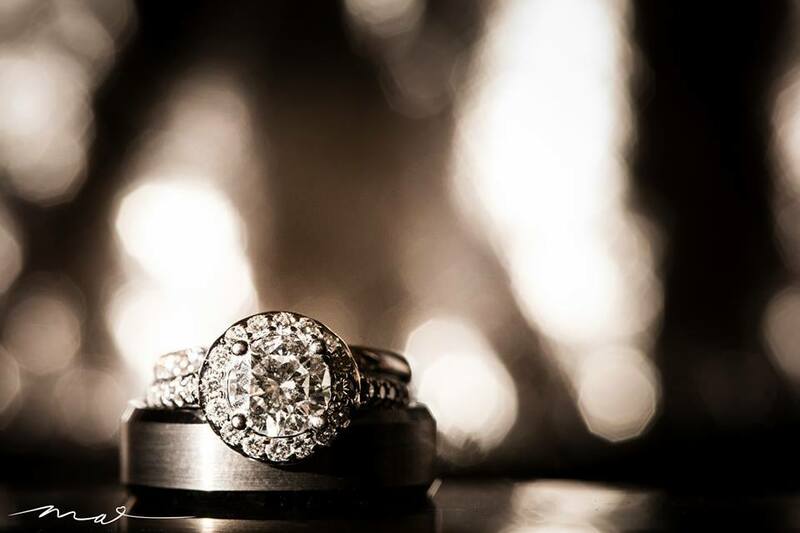 Look at that stunning ring! Melanie and her girls got ready at her twin sister Nikki’s house, which had great natural lighting and lots of room for our massive kits. 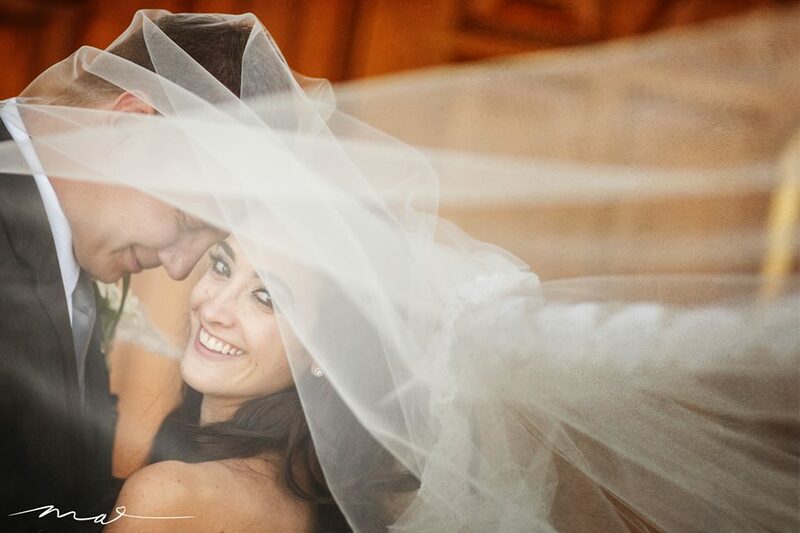 Melanie wore a cathedral-style veil which made taking photos even more fun and creative. My favorite part of weddings are always the gaggle of flowers girls! So cute. I grew up going to Armenian Orthodox churches, which are identical to the Greek ones. So much architecture and beauty. With the bride’s Greek heritage, I’m sure St. Nicholas church felt right at home. A sweet moment between Melanie and Andrew before the big party started. Let’s face it. 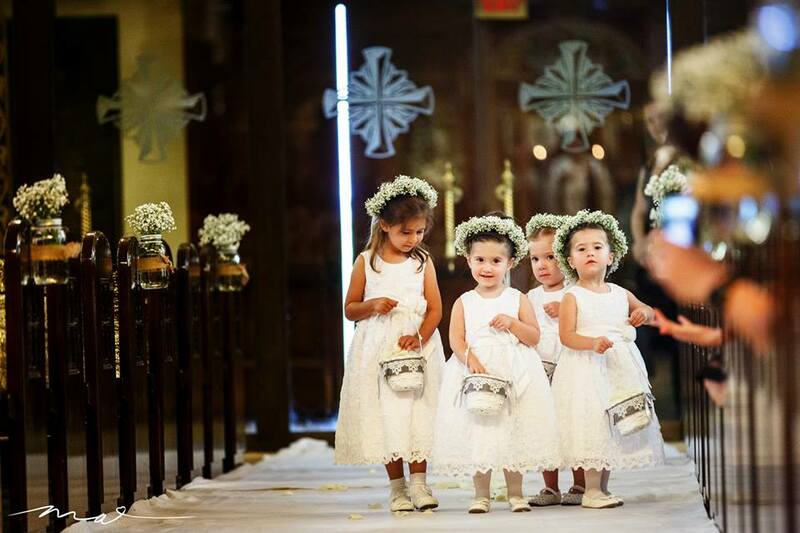 This is hands-down the best bridal party photo ever taken. These girls were so much fun to get ready in the morning and as you can see their carried on with their mischief right through the day! Looks like an epic party to me! 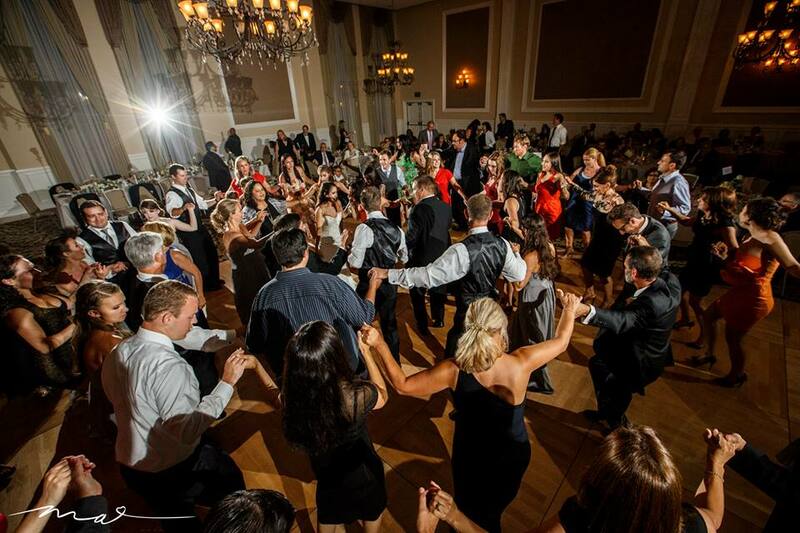 I love Greek weddings…complete with the traditional circle dances. Congratulations to the bride and groom! I look forward to beautifying these ladies next year when Nikki, Melanie’s twin sister gets married in November 2015! Here is one of the many beautiful brides I got to work on this summer. 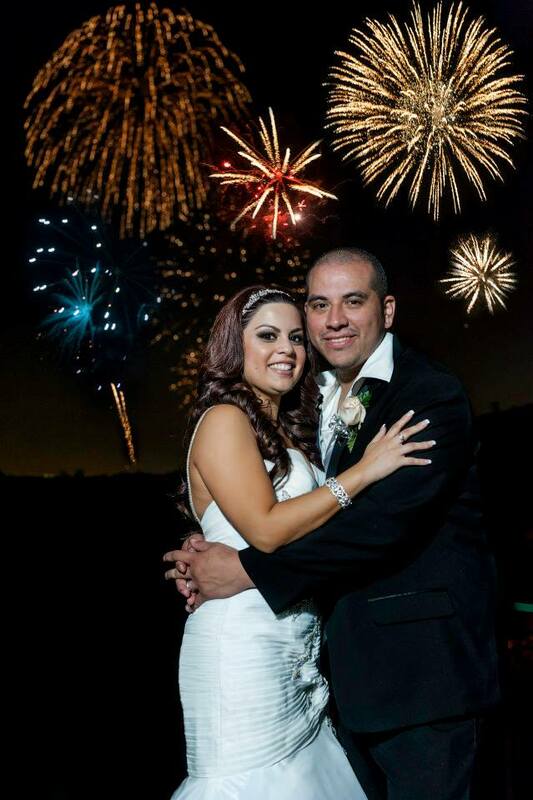 Mr. and Mrs. Aldrete wed on the Fourth of July at The Castaway. I had my own wedding reception at this amazing venue just last year so I was super excited to hear they would be having their ceremony and reception there! 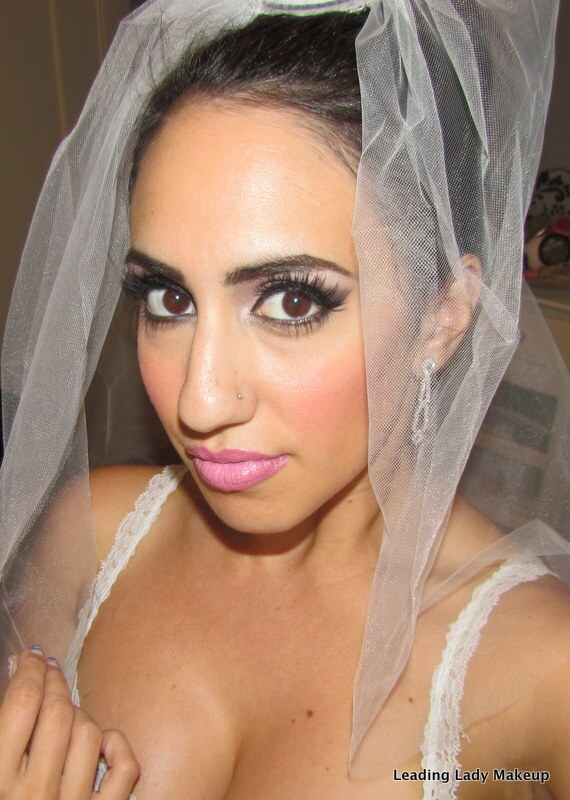 Sandy wanted a dramatic smoky eye (I LOVE when brides go smoky!) so I started off with her eyes first to avoid eyeshadow fall out. 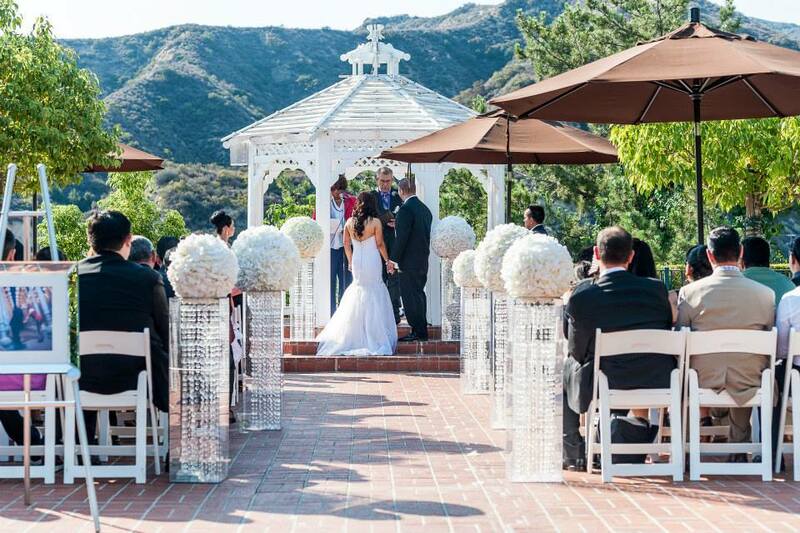 Castaway has a stunning gazebo that served as the center of the ceremony. 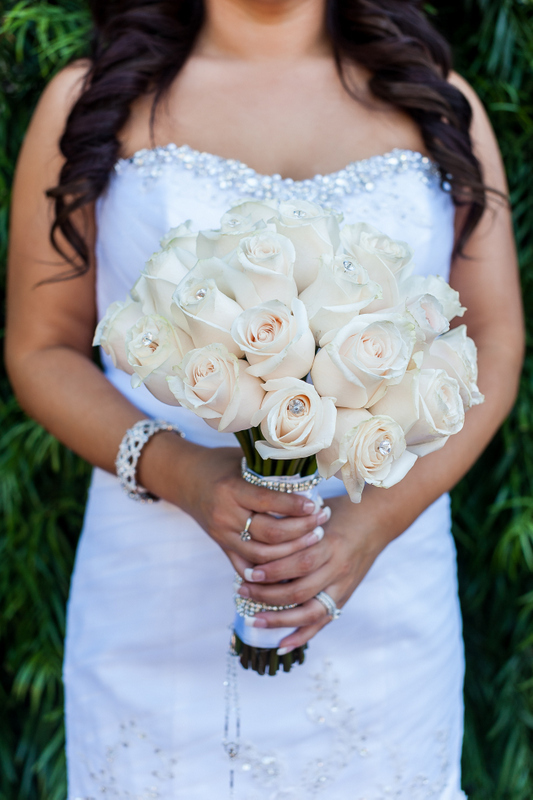 Sandy is a “bling-loving” bride, as you can tell from her sparkling dress, bejeweled bracelet and radiant roses. I love this picture of them. I’m also obsessed with those floating flower balls as aisle decorations- total showstoppers! Sandy and Oscar’s guests danced the night away under the stars at Castaway. 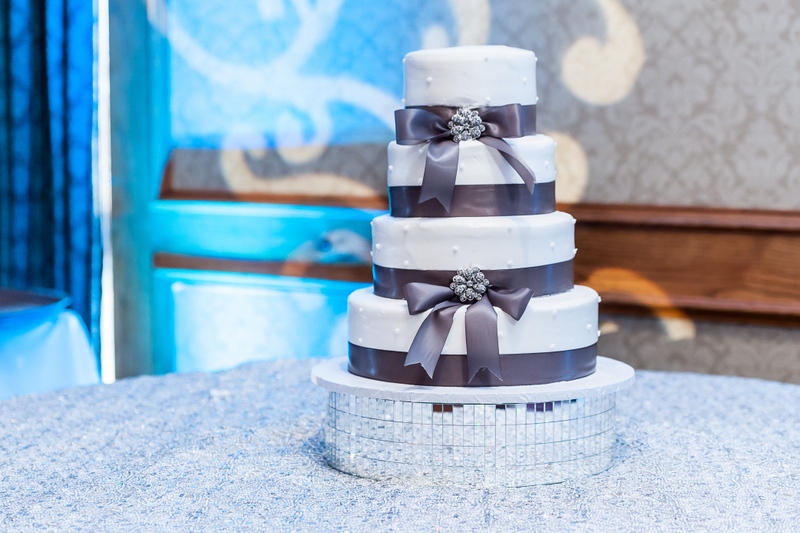 Check out the breath-taking cake and mirrored disco-ball stand underneath! This past weekend I hosted a booth for the first time at the ever-upscale I Do! 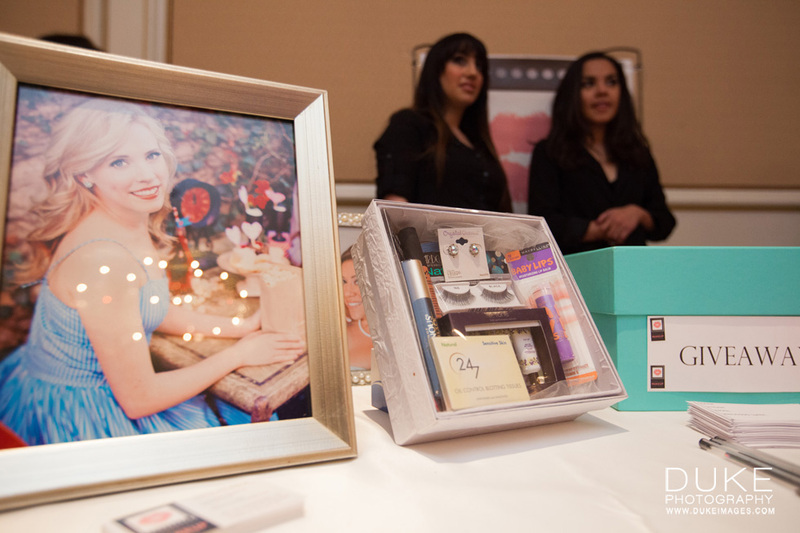 Bridal Event given by Fancy That Events at the Langham Huntington Hotel in Pasadena, Calif. It was such a cool experience! With my trusty PR guru and dear friend Jennifer Castaneda by my side, we met bubbly glowing brides and their friends and family members. Being a recent bride myself, I was “tricked” many times by booth giveaways that were actually ploys. I’d get phone calls saying that I won a giveaway, and to claim my prize I’d have to sit through a sales pitch, or I’d have to pay for a service first. It just felt so insincere and was such a waste of my time. Brides have enough going on planning their weddings, they don’t have time to be harassed! 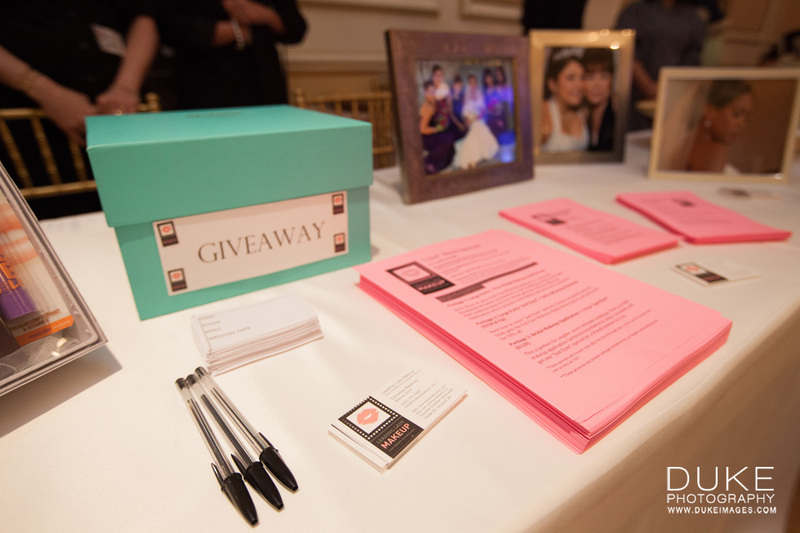 That’s why for the brides at this event, I decided to create a giveaway that had no strings attached. It was very simple: people put their names and contact info in the box. I had Jen pick out a name. I called them. They won. I sent them the prizes. Done. L’oreal Voluminous Carbon Black Waterproof Mascara – I actually have this in my kit and use it exclusively on brides. It’s a great waterproof mascara because it doesn’t budge. No flaking, no clumping. You do however, need makeup wipes to remove it at the end of the night: this stuff is legit! NYX Soft Matte Lip Cream: Three words: I. Love. These. It goes on with a doe foot applicator, just like lip gloss, but it dries down to a creamy matte. It’s long-wearing and doesn’t dry out your lips as much as other long-wearing lip products do. Zon Cosmedix 24 7 Oil Control Blotting Tissues These are a bride’s best friend! Nothing is worse than piling on powder throughout your reception. These little babies will remove extra oils from your skin (T-Zone neutralizer, much?) in a flash. Just throw them in your bridal clutch and touch up ONCE during the reception. Done. 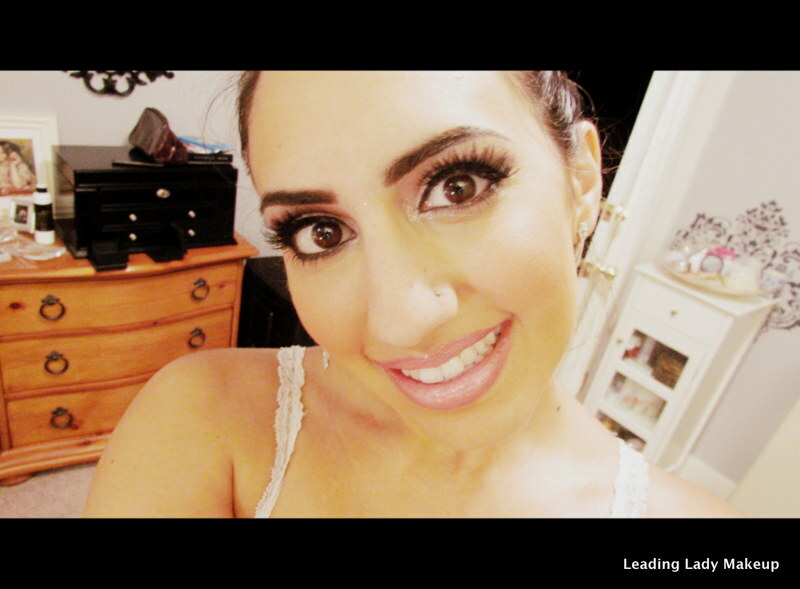 Ardell Natural Lashes in Beauties Ardell is the leading false eyelash company for a reason. The lash strips are flexible so they adhere to your eye shape, and they come in a million different sizes for a good price. I can use my Ardells about 4 or 5 times before I throw them out! Tarte Travel Size Eye & Skin Primers and Moisturizer Tarte has amazing all natural skin products. This isn’t a drug store brand, but I wanted to include this travel size trio so the bride could take it along on her honeymoon. Maybelline Baby Lips With SPF 20 These puppies are getting rave reviews from everyone in the industry. I would consider these to be an affordable version of Fresh’s Sugar lip balms. I’d rather pay $2.97 over $22 any day! Wear these alone or under lipsticks for extra hydration. Pond’s Makeup Wipes: You can’t see them in the photo but they are behind all the other makeup.These are the drugstore dupes for MAC’s makeup wipes. I actually used these for my own wedding and they worked just as well. Super gentle on your skin, too! My favorite way to use them is to use one wipe for both eyes, another for your face, then rinse your skin with warm water and face soap. The wipes will break down the makeup and the soap will cleanse your pores. …and I threw in a cute pair of bridal earring studs to seal the deal. There were almost 100 entries submitted for this giveaway during the four hour show and I just shipped it off to the lucky bride today. 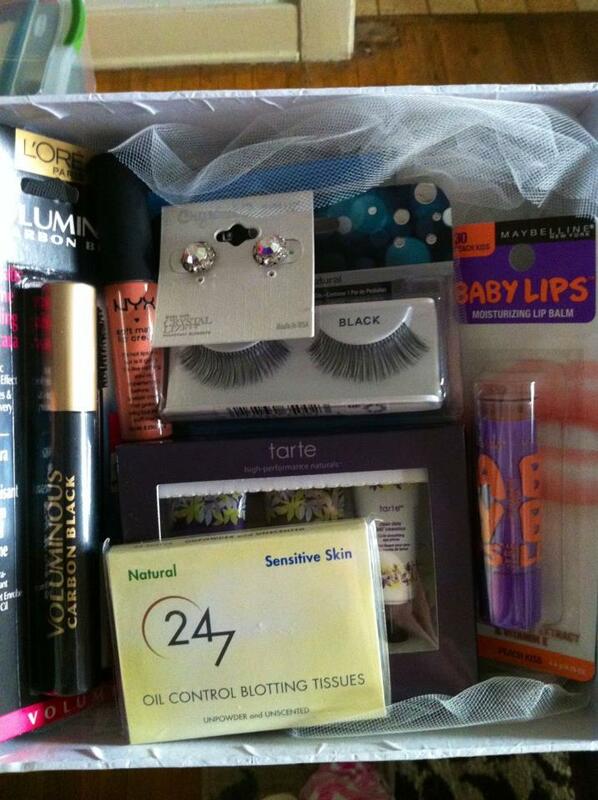 Would you guys like to see another bridal giveaway on my blog or Youtube channel? Let me know in the comments below. 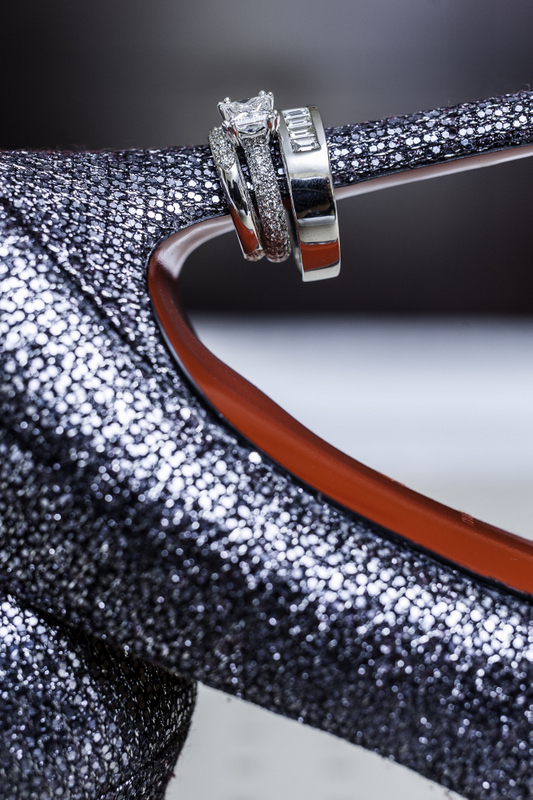 This week’s Wedding Wednesday is all about making your makeup last all day and all night. There is a wonderful product out there called setting spray that many companies make and will help set your makeup for the long haul. These sprays help protect your makeup against heat and humidity- great for hot weather or dancing up a storm! I recommend holding them about 10 inches from your face and spritz once on the left, once on the right, and once in the middle. Even better, have someone hold the bottle and do it for you (while your eyes are closed, of course!). Urban Decay’s “All Nighter” Long Lasting Makeup Setting Spray (long name, I know) is a reliable product and actually comes in a sample size (.5 oz.) for $12 as well as full size (4 oz.) for $29. A little pricey but you may get so addicted you will use it every day. This product is hypoallergenic and claims to last up to 16 hours! 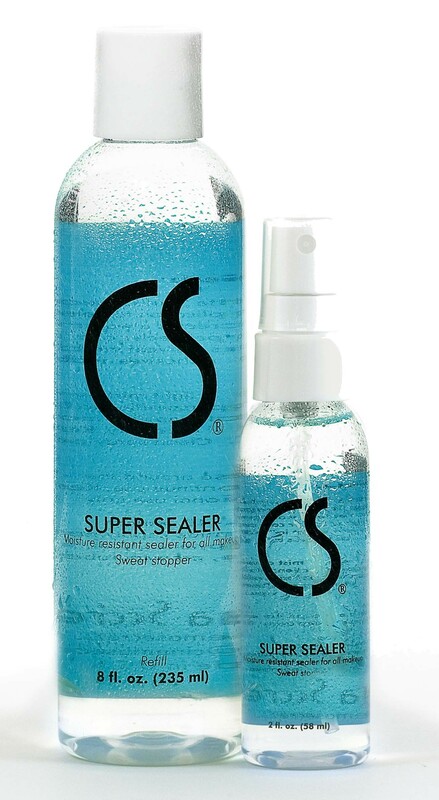 Cinema Secrets’ Super Sealer is what I used on my own wedding day and I often use it to set my maternity paintings on clients. This stuff keeps makeup fresh on your face all day. It comes in a trial size (2 oz.) for $10 or full size (8 oz.) for $30. Happy Wedding Wednesday everyone! 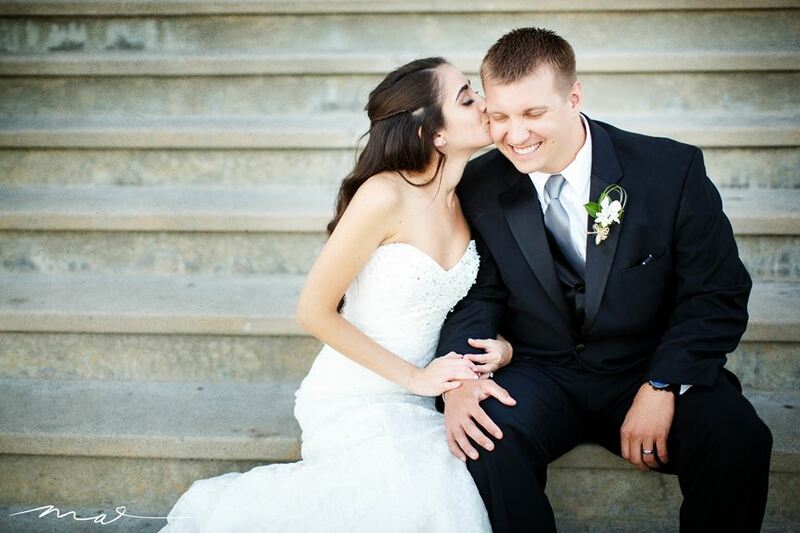 My friend and fellow beauty blogger, Christina of Beauty Queen Blog gave me the brilliant idea of bringing you all a wedding-related post every Wednesday. This very first WW post is my own wedding makeup that I recreated for the video. SPOILER ALERT: Dylan totally makes an appearance in this vid. 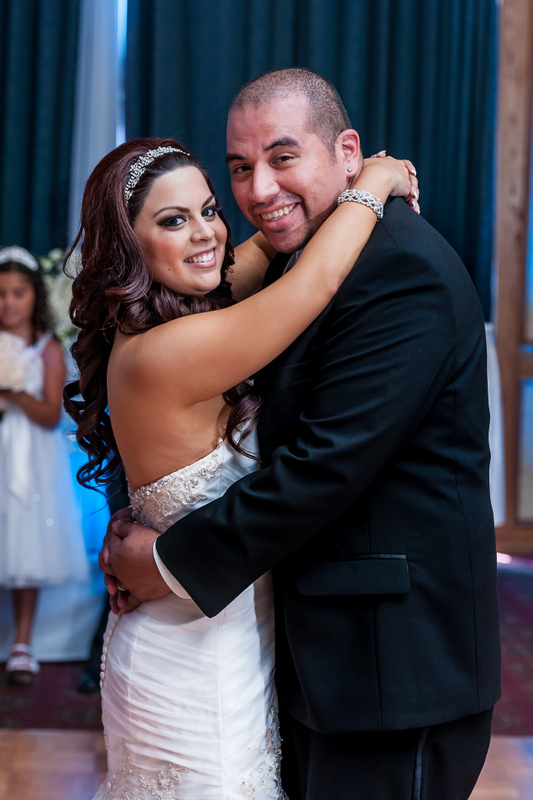 Since our wedding day (July 28th of this year), everyone has been asking me how I did my own makeup for my wedding. Why didn’t I hire someone else or have one of my many makeup artist friends do it? Was it stressful? The fact is, the process of putting on makeup is therapeutic for me. I truly enjoy sitting there crouched on a stool chiseling my face into perfection! 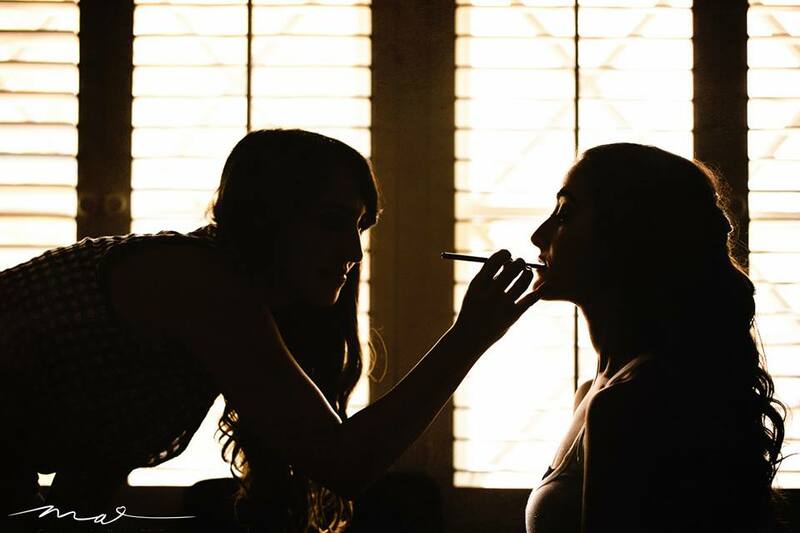 The morning of the wedding was so relaxing for me– I just sat there in my robe and played with makeup until it was time to meet Dylan at the church. I am the WORST model. If I had anyone else doing my makeup they would have thrown their brushes at my head because all I do is peek open one eye the whole time and ask them if I could see how it looks. 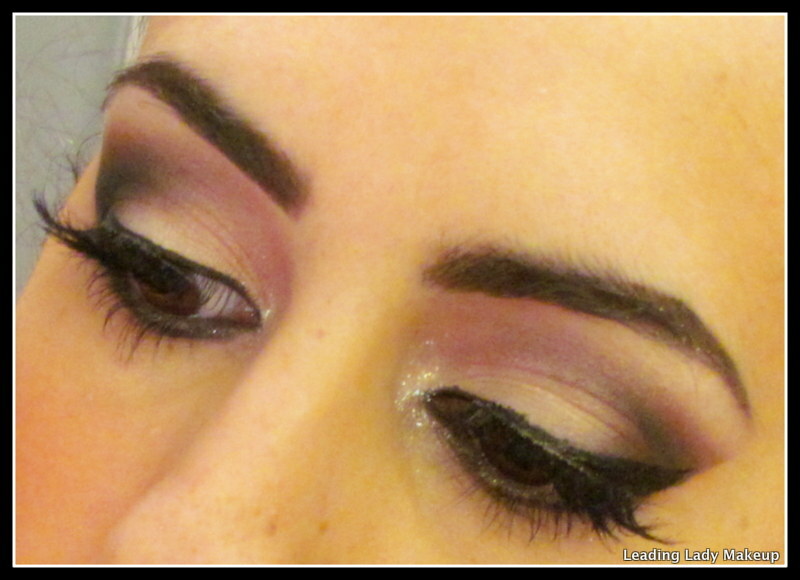 I have to admit though, I felt a lot of pressure for my makeup to look amaze-balls that day. I gave myself two trial runs just to be sure. I just didn’t want to let anyone down! I was really happy with the end result. The makeup was bold and bridal at the same time- it truly was ME. This video is also cool because I show you guys how to use an airbrush gun in it! If you guys want a detailed tutorial on airbrush makeup, please let me know in the comments below and I’ll make it happen.